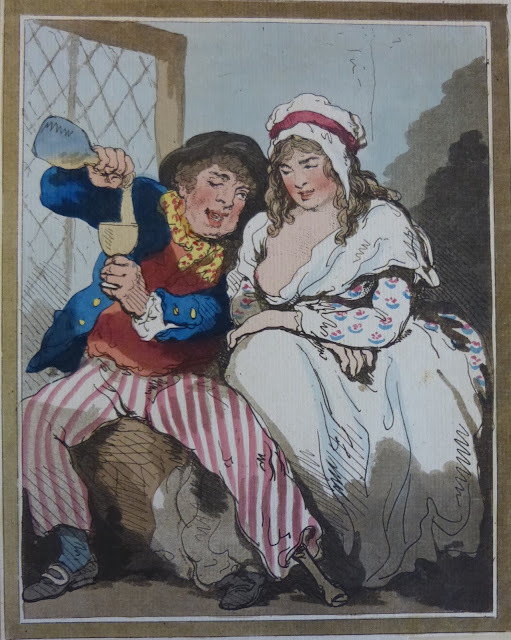 Courtship in Low Life, Thomas Rowlandson, 1785, Royal Collection Trust. The curators at the Royal Collection trust suppose this print to have been acquired by Queen Victoria in the nineteenth century. It was originally accompanied by a matching print entitled Courtship in High Life. 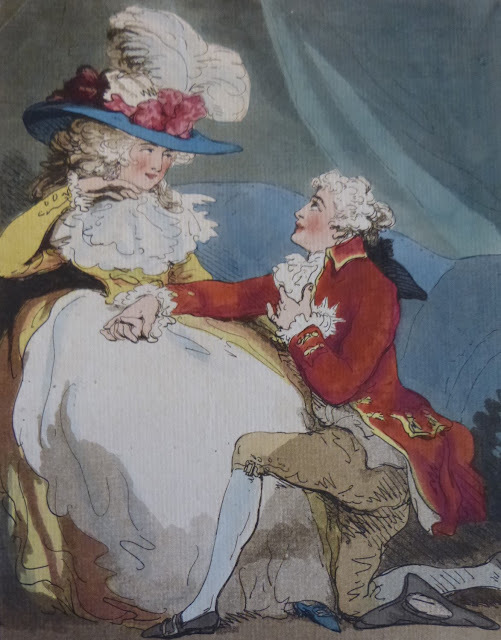 The latter, shown above, depicts the future King George IV, the current Prince of Wales, courteously kneeling at the foot of a well dressed woman. The humorous contrast comes from the drunken tar in the former, pouring a glass of wine and winking at a woman "in a state of undress" as the curator so delicately puts it. Our sailor wears a black round hat with the short brim slightly upturned, possibly a buck hat. His curly brown hair might be cut short, but it's hard to tell with the detail in this image. Around his neck is a yellow neckcloth dotted in red, or perhaps floral. Looking closely, it is easy to tell that the original engraving did not grant our tar a waistcoat. There are no lines, no pockets, and no buttons. Possibly Rowlandson wanted his sailor to be wearing a shirt alone, or maybe a smock tucked into his trousers. The red may have been an attempt by the colorist to impart a waistcoat on our mariner. His trousers are striped, but this was also added by the colorist. With a wooden leg for his left, he wears a blue stocking on his one good foot, with a white metal oval buckle on his shoe. His jacket is blue with yellow metal buttons. 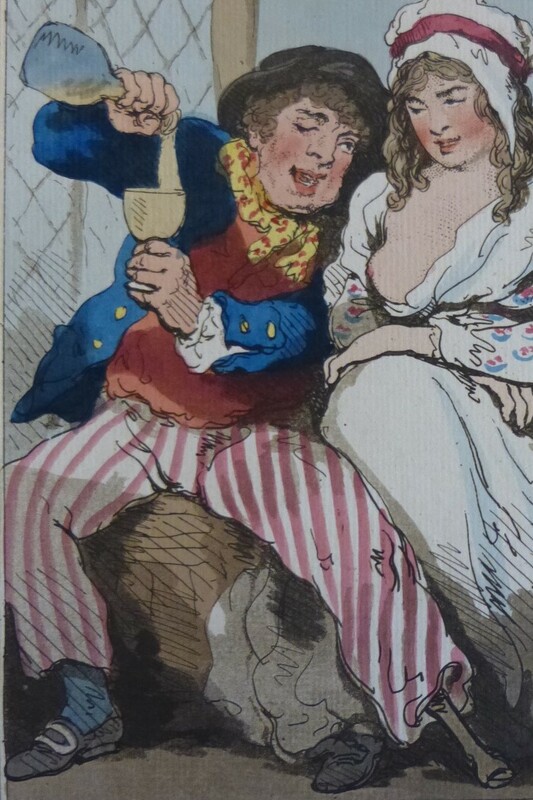 Interestingly, the open mariners' cuff on his left wrist still bears the yellow buttons, so perhaps Rowlandson intended them to be non-functional.